ALL I WANT FOR CHRISTMAS IS… ONE MORE SHOW! DECEMBER 22nd  JUST ADDED! NEW YORK, NY  Due to overwhelming demand and five sold out shows, a sixth Christmas show has been added on December 22nd! Queen of Christmas Mariah Carey previously announced that she will bring her all-time favorite, chart-topping, evergreen Christmas hits to the Beacon Theatre for five unprecedented performances this December 15, 16, 18, 20 & 21. Tickets for the additional show go on sale Friday, December 12th at 10am. Honey B. Fly will host an exclusive ticket pre-sale for members on Thursday, December 11, from 10am-10pm ET. (Get your Live Pass for access!). 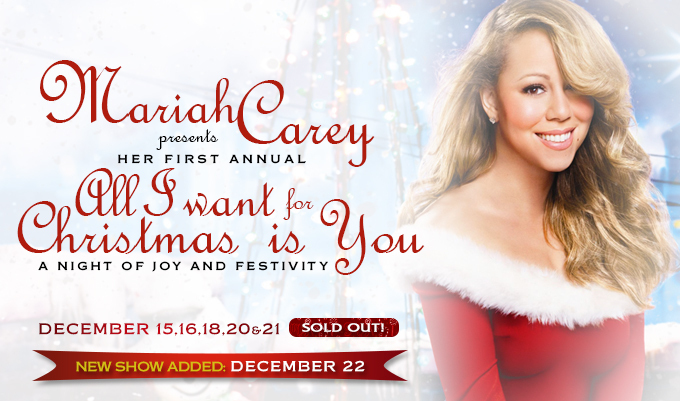 Celebrating the 20th anniversary of her worldwide bestselling album, Merry Christmas, Mariah will spread festive love and cheer on stage performing her classics from the album that is certified 5x platinum by the RIAA and has sold over 14 million copies to date, as well as hits from her critically acclaimed holiday follow up, Merry Christmas II You. Visit the TOUR section for the full schedule of concert dates and links for tickets!